Once you hit the ripe old age of 70 and have lots of free time on your hands, you have to make some big decisions on how to fill it. Maybe you'll get really into traveling, or... golfing? Or, maybe, you'll take a cue from this grandfather in Taiwan, who dedicates his days to playing Pokémon Go with an insane waist-mounted rig that allows him to use 11 phones at once. Chen San-yuan, a septuagenarian living in Taiwan, has turned heads in his home country for being so obsessed with Pokémon Go that he walks around playing it on 11 different phones at once, all of which are hooked up to a waist-mounted rig he engineered. Amazingly, the new setup is an improvement on the one he was using before, which was built like a dashboard on a bike. Chen, who is affectionately known as Uncle Pokémon, first learned about the game from his grandson, and has taken up playing as a hobby to make friends and to hopefully fend off Alzheimer's disease, according to a recent BBC story about him. It's not a cheap pastime either, as he reportedly spends nearly $1,300 a month to keep the whole operation running. As for how he avoids untimely device shut-down, he schleps around toting a substantial backup power pack that's constantly charging them. 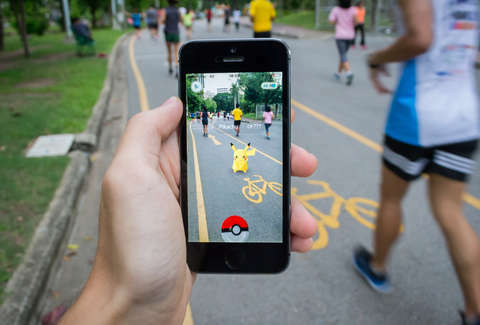 Although Pokémon Go mania has died down substantially since the wildly popular mobile first exploded on the scene in 2016, Chen is a diehard fan. His favorite Pokémon is Snorlax and he avoids assaulting gyms because it "hurts peoples' feelings," per a report from a Taiwan news site. Locals say they see him out playing all the time, frequently later at night. But hey, gotta catch 'em all, right? May we all embrace our twilight years like this one true Pokémon Go Master.